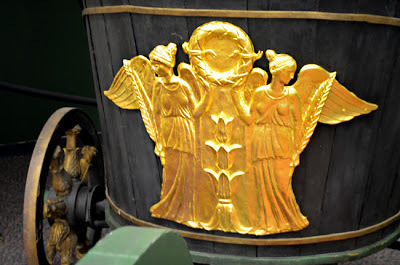 What do horse-drawn vehicles with wooden spoke wheels, the Loew's Grand Theatre, multiple Oscar wins, and the Atlanta-Fulton County Public Library have in common? No, not Gone With the Wind, but that's very good guess. 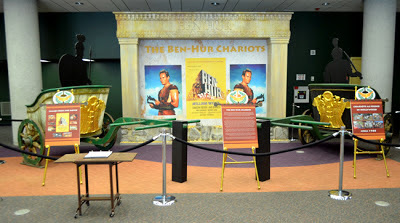 I'm talking about the 1959 film that won 11 Oscars, including Charlton Heston's for Best Actor...the film Ben-Hur. 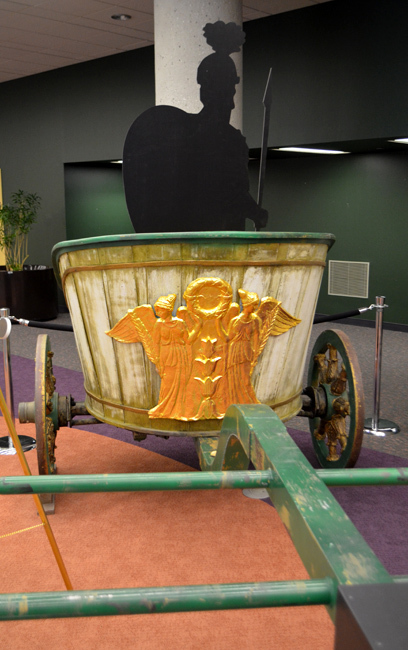 Two of the original chariots from the film have been restored and are on display at the Atlanta-Fulton County Public Library's Central Library. It's a temporary exhibit, so if you're a cinema buff, or history enthusiast, now's your chance to see up close and personal some of Hollywood's most iconic movie artifacts! The Chariot Race scene—more than nine minutes long—was one of the most exciting and the most violent, for that time, movie scenes of the day. 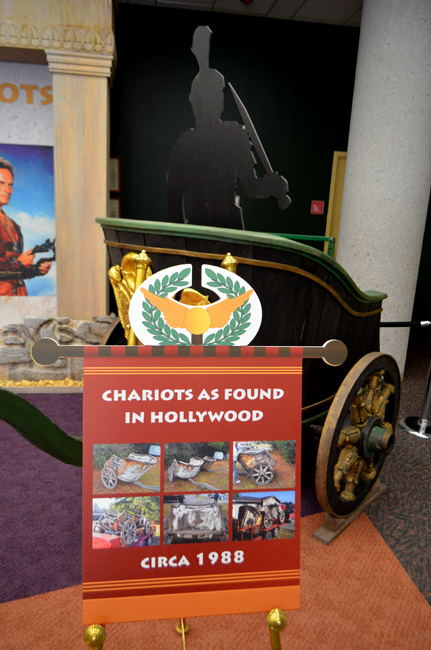 These chariots were not discovered until 1988, nearly 30 years after the film debuted. They were sold at auction in California and have been in Atlanta ever since, but only on display at the Library since 2011. The chariots are on loan from Entertainment Design Group in Austell, Georgia, a company with a most impressive resume...everyone in Atlanta knows their work, one way or another! The film itself is right at 3.5 hours long, so a chase scene of nine-plus minutes might not seem long, but imagine that it was wooden chariots and temperamental horses, not the cars or spaceships that we watch on the big screen today, not to mention there was no CG at the time. One of the really cool bits of trivia about these chariots is that in 1999, the owners had the distinct privilege to show them off, in their fully restored glory, to none other than Ben-Hur—himself, Charlton Heston. He was here in Atlanta for an industry event...that had to have been a great day! When the chariots were found, they were in serious disrepair. They were purchased for $2,500 at auction and another $10,000 was invested to bring them to museum quality artifacts...quite fortunate for us! So, if you're still wondering about the associations I made when opening this post, I was indeed drawing similarities to Gone With the Wind. 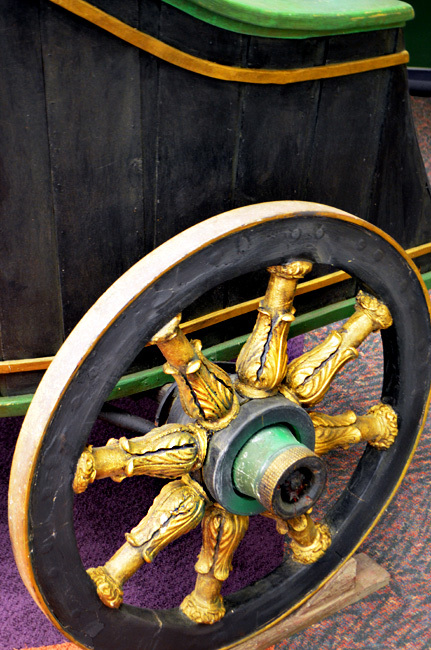 There were horse-drawn vehicles with wooden spoke wheels in both films (wagons and chariots); both premiered at the Loew's Grand Theatre (world premiere for Gone With the Wind and Atlanta premier for Ben-Hur); both won a record number of Oscars their winning years (nine for Gone With the Wind, 1939, and 11 for Ben-Hur, 1959); and both have exhibits at the Central Library in downtown Atlanta (the Margaret Mitchell exhibit on the 5th floor and the Ben-Hur Chariots exhibit on the ground floor). A couple more comparisons...when Charlton Heston (who I first saw in Planet of the Apes) won the Oscar for Best Actor for Ben-Hur, Susan Hayward was the actress who announced the win (Bob Hope was the Master of Ceremonies that year). Hayward had moved to Hollywood from New York in 1937 to audition for the part of Scarlett O'Hara in Gone With the Wind, which she of course didn't land, but she did go on to build a remarkable acting career. After numerous Oscar nominations and an eventual win, she moved to Georgia where she lived out the remainder of her life. Hayward's last television appearance was again at the Oscars. She co-presented the Oscar for Best Actress at the 46th Academy Awards in 1974 with none other than...Charlton Heston. 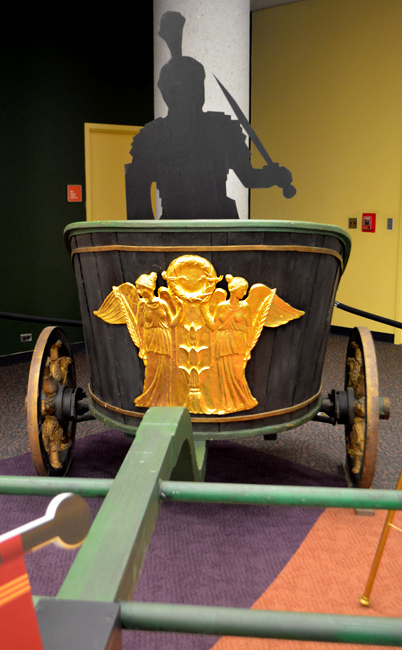 So, you see...these Ben-Hur chariots have some very deep ties to Georgia and Atlanta. I hope you'll make the time to check them out the next time you're in downtown. Psssstttt. Charlton Heston died in 2008. He couldn't have been here for an industry event in 2011. Thanks! I knew that, too. I'll go back to my source and update that particular bit.